Facebook is a nasty thing to study. 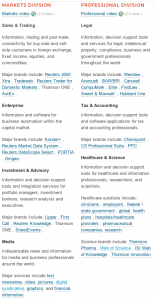 It is much more complicated – in terms of interface, architecture, features, etc. – than Twitter for example. It has a lot of users and different types of interaction spaces. It is rather easy to extract a lot of data from it, particularly for companies creating apps and focusing on individual users and their network neighborhoods – but it is really difficult to get any kind of macro view. 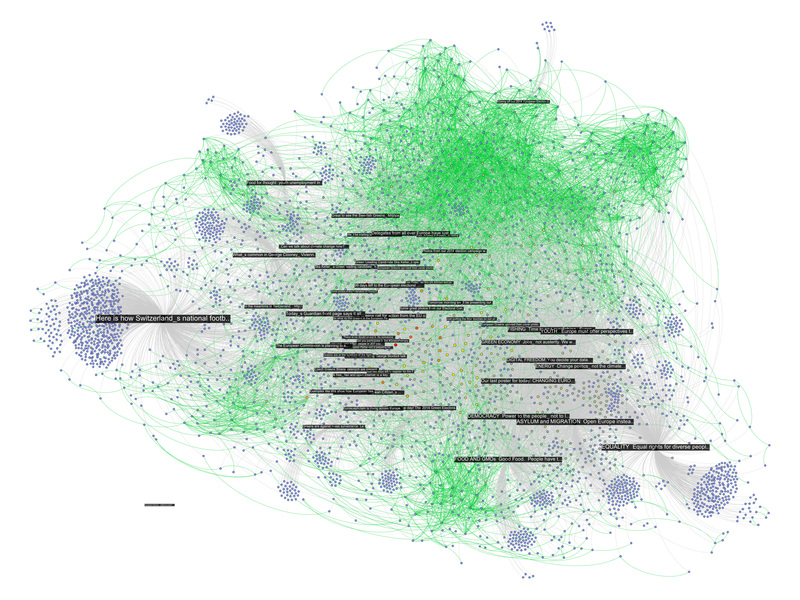 Pages and groups are the main “holes” through which researchers that don’t have an agreement with Facebook can get an idea about interaction patterns and the brand of publicness the service provides. Some time ago, I added page analysis features to netvizz and we’ve been doing some interesting things with that feature. 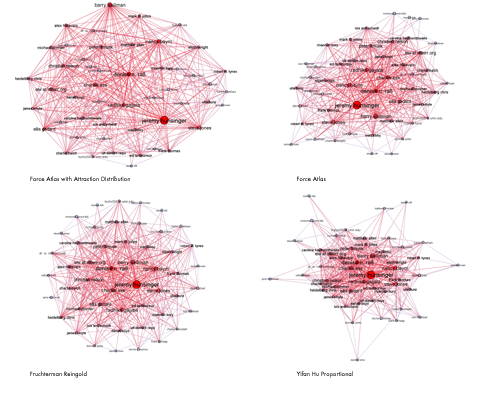 A couple of months ago, I learned from Erik Hekman that the SQL code I used to extract friendship connections for ego networks and groups could actually be applied to any list of users. I am not yet fully sure how privacy settings affect this, but for a while now, the developer version of netvizz has been able to extract friendship connections between users active on a page. This feature will not make it into the public version (or maybe limited to a very low number of users), because the number of API calls necessary to get the connections grows with no of users^2 / 2, quickly leading to impossible waiting time. It’s still an interesting approach that merits a quick post. 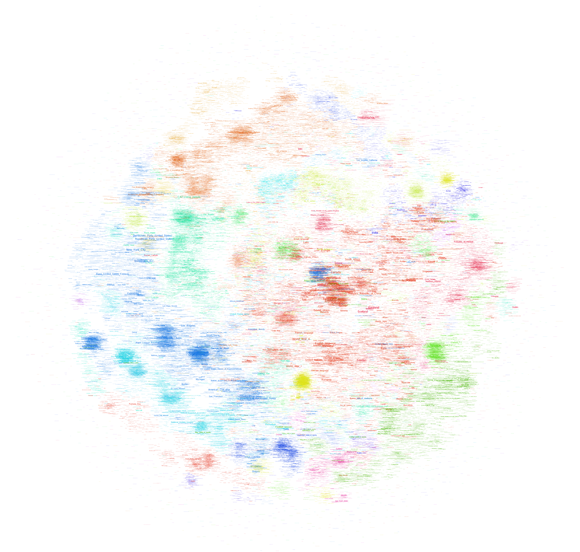 The following network diagram (click for larger image) shows a bipartite graph containing the last 50 posts from the Facebook page of the European Green Party and the 3768 users liking or commenting posts. Posts are in black and users range from blue to red depending on the number of times they engaged with content on the page. 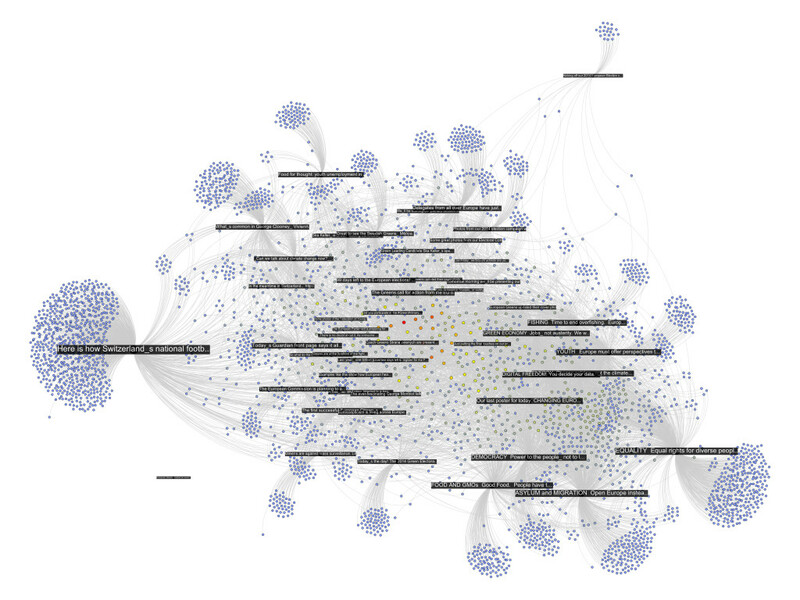 There are already quite a number of things one could say about the page using the standard netvizz data. But let’s have a look what friendship connections can add. 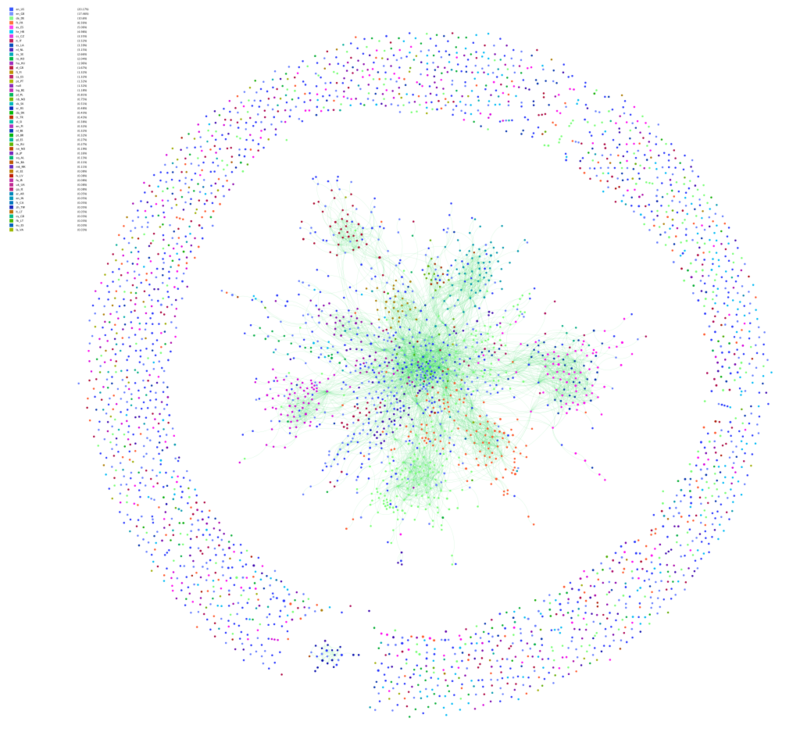 The next diagram is exactly the same as the last one, but adds friendship connections between users in green (click for larger image). There seems to be one pretty big group at the top that are a lot friends with each other and those are probably activists. The contents in that area seem to have to do with the official start of the campaign for the upcoming European Parliament elections. At the bottom slightly to the right is another dense cluster of users that one could qualify as issue audience – users that engage with topics such as GMOs or surveillance. The other two groups on the left are harder to qualify. I have to add an important point though. 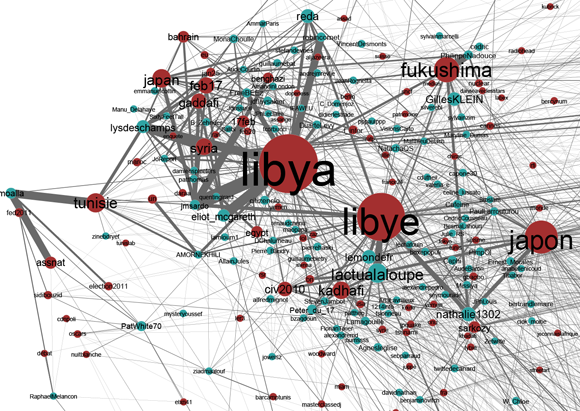 To facilitate comparability, I spatialized the nodes with friendship relations present. To generate the first diagram, I then simply removed those edges but left the layout intact. In the following image, though, I reapplied Mathieu Jacomy’s ForceAtlas 2 algorithm. First, we notice that most of the users are not connected to the big component in the middle; there’s a scattered audience next to the activists. 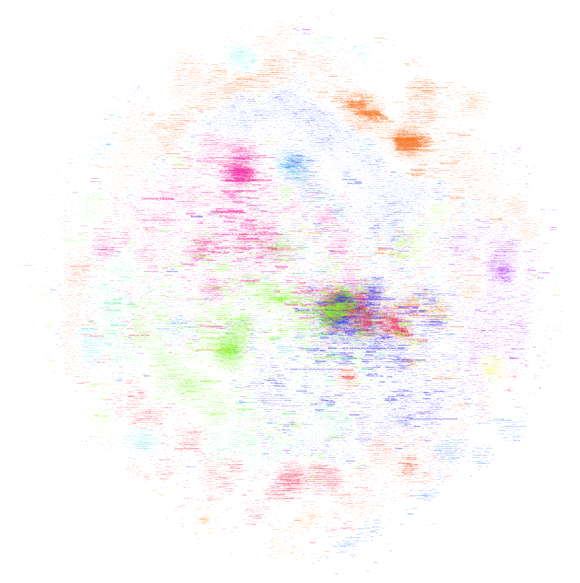 Second, we see quite a large number of components with two or three nodes. These are very probably artifacts of Facebook’s architecture. If I like a post on a page, it has a certain chance of appearing in my friends’ newsfeed, where it can the be liked or commented on without every going to the page directly. I’ve seen these smaller components even more on other pages and this seems to be the most probable explanation. 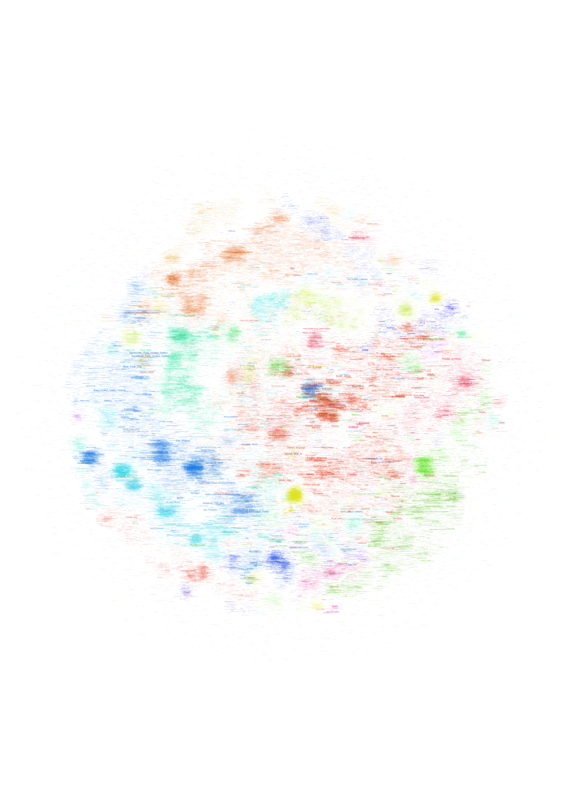 Third, despite stronger clustering without the content holding things together, there is still a very large connected component that comprises a bit over a third of the active users. 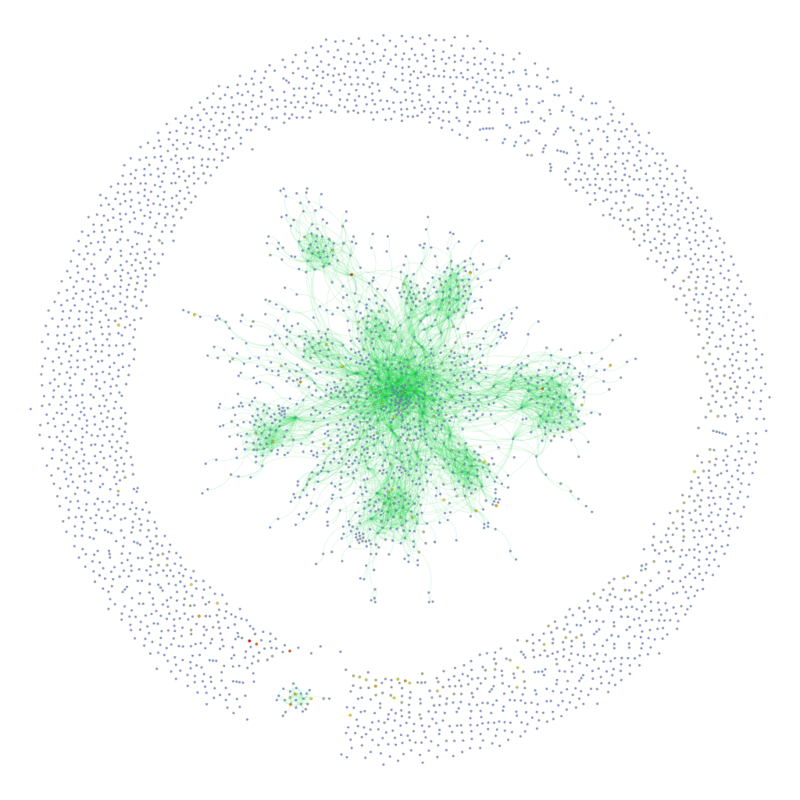 Fourth, the most active users (the heat scale still shows number of engagements) are not necessarily the most connected ones. While netvizz provides node data in anonymized form, all of this stuff is available through the Facebook API with real names attached. I hope that users are aware at this point that pages are highly public spaces that can easily be profiled in quite some detail by anybody with a little programming skill. 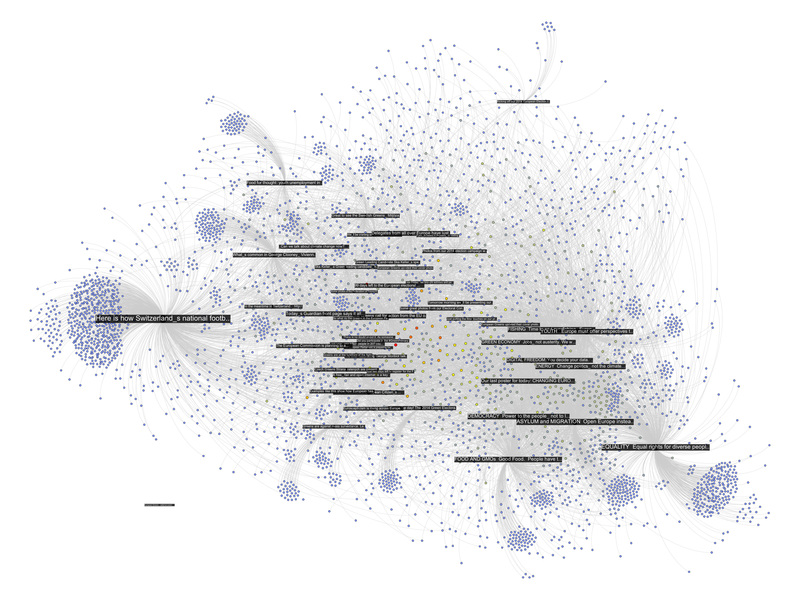 If I wanted to disrupt this organization, I’d start with the red dot in the last network diagram. Is it chilly in here? This could be developed much further as well. But I am not sure yet how much weight one can put on the friendship data because of the question how much is missing because of privacy settings (which you may want to learn more about). 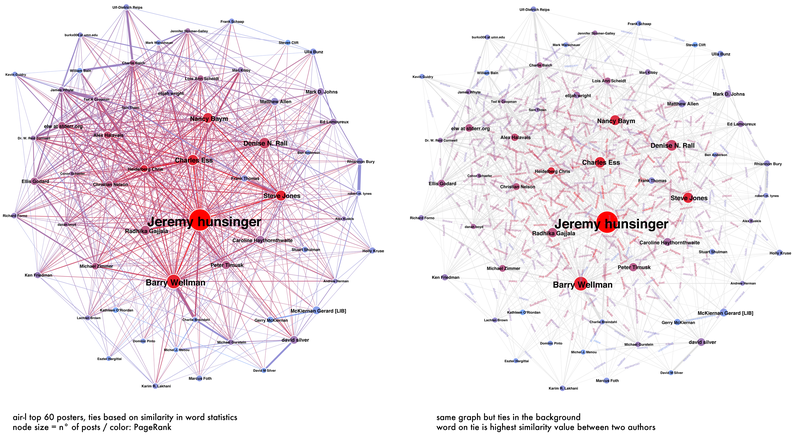 The fact that obviously a lot of connections are publicly visible and relatively easy to harvest in small doses would merit much more discussion on its own. I am also pretty sure that big pages over large timespans are completely out of the question for reasons of the dreaded combinatorial explosion kicking in. Remember the rice corns on the chess board? And even if one would succeed in hammering the API, the data would be very difficult to analyze and to untangle. Lots of custom math needed; or a lot of patience; or both. This could go nowhere but the results warrant a followup. Vielleicht noch mehr als der Berührung der Menschheit mit der Natur verdankt die Graphentheorie der Berührung der Menschen untereinander. Perhaps even more than to the contact between mankind and nature, graph theory owes to the contact of human beings between each other. 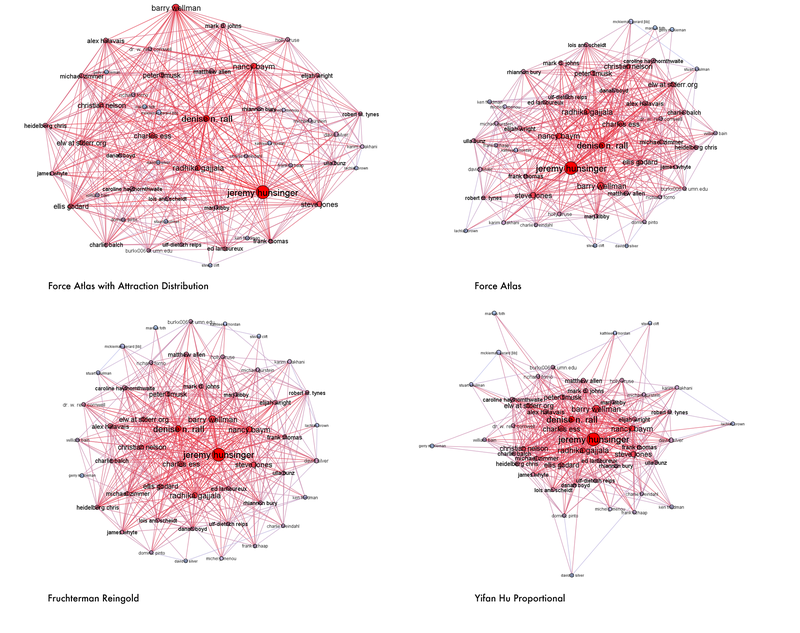 I am currently writing a paper to submit to the new and very exciting journal computational culture on the use of graph theory to produce “evaluative metrics” in contexts like Web search or social networking. 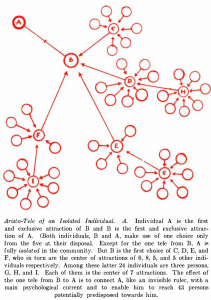 One of my core arguments is going to be that the network as descriptive (mathematical) model has never stood in opposition to the notion of hierarchy but should rather be seen as a conceptual tool that was used in different fields (e.g. 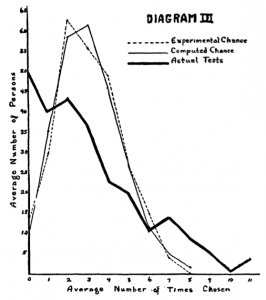 sociometry, psychometry, citation analysis, etc.) over the 20th century to investigate structure and, in particular, to both investigate and establish hierarchy. This finally gave me an excuse to dive into Jacob L. Moreno’s opus magnum Who Shall Survive? 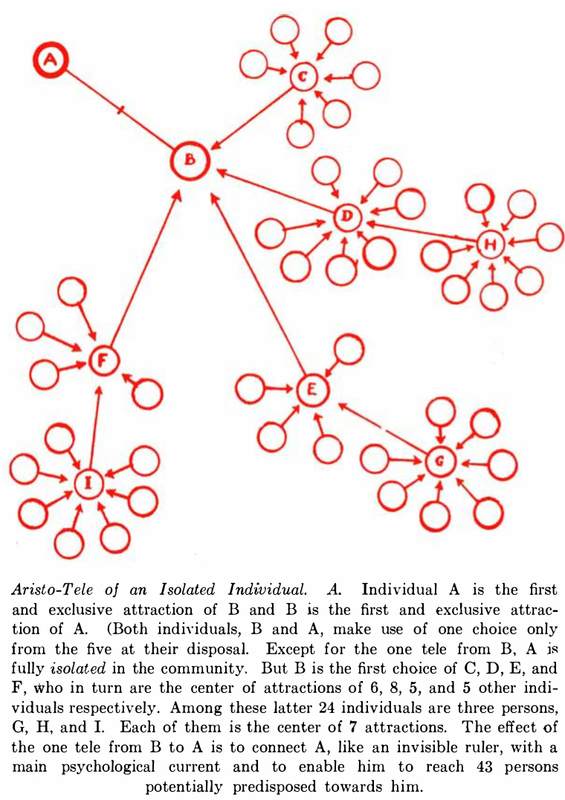 from 1934, which not only founded sociometry but also laid the ground work for social network analysis. This is one of the strangest books I have ever read, not only because the edition from 1978 reveals the author as a deeply Nietzschean character (“Actually, I have written two bibles, an old testament and a new testament.“), but also because the sociogenic therapy Moreno proposes as an approach to the “German-Jewish conflict” puts the whole text in a deeply saddening light. But these aspects only deepen the impression that this is a fascinating book, really one of its kind. 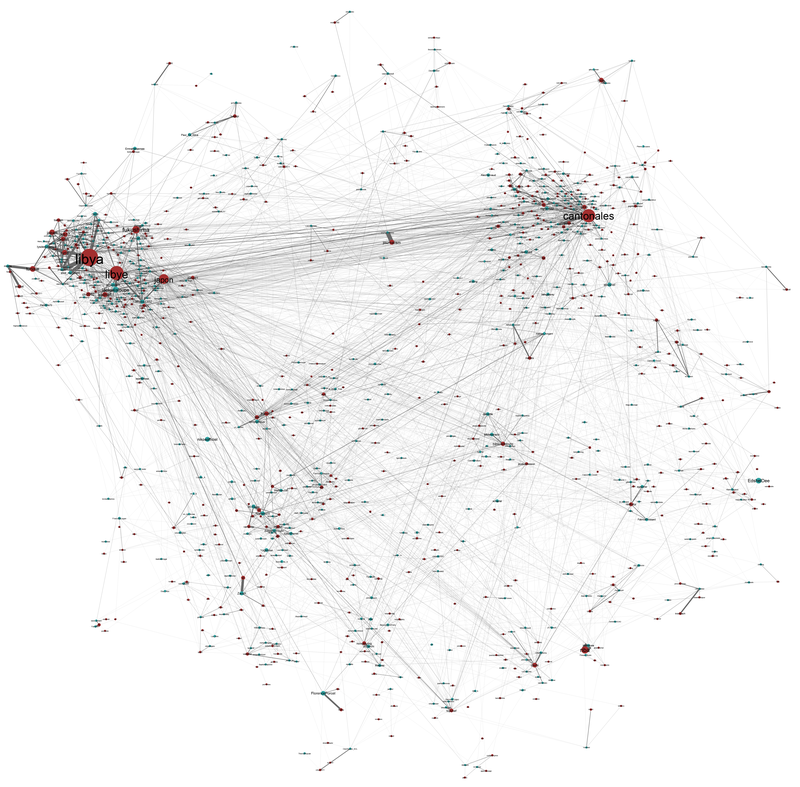 By looking into the history of the field, I hope to show that the observation of uneven distributions of connectivity in real-world networks, e.g. the work by Hindman and others concerning the Web, are certainly not a discovery of the “new science of networks” of recent years but a virtual constant in mathematical approaches to networks: whenever somebody starts counting, the result is an ordered list, normally with a considerable difference in value between the first and the last element. When it comes to applications of sociometry to sociology or anthropology, the question of leadership, status, influence, etc. is permanently in the forefront, especially from the 1950s onward when matrix algebra starts to allow for quick calculations of different forms of centrality. Contrary to popular myth, when Page and Brin came up with PageRank, they had a very wide variety of inspirational sources to draw from. 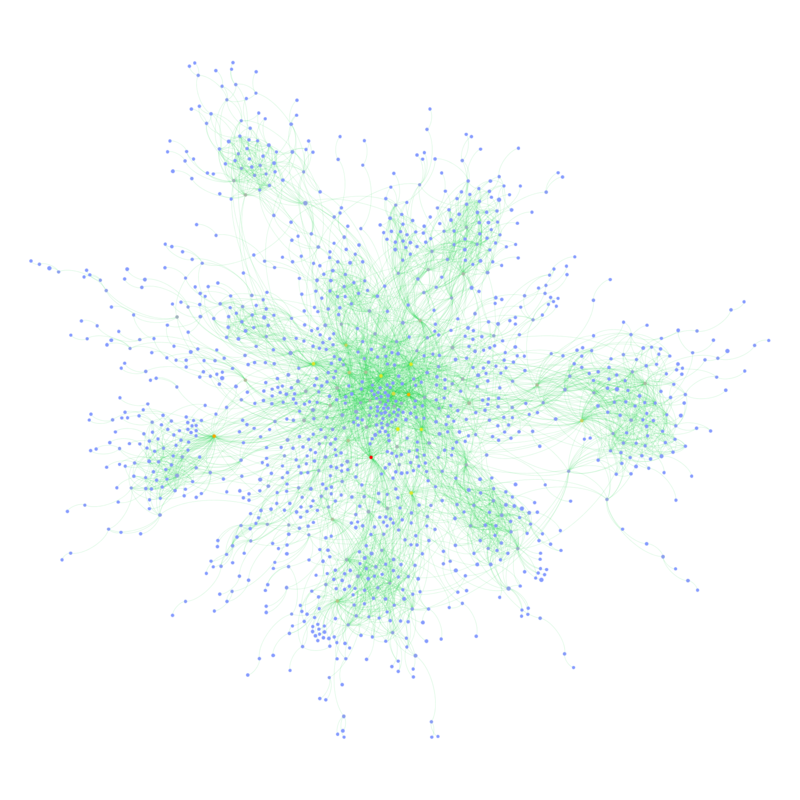 Networks and ranking had been an old couple for quite a while already. When it comes to scrutinizing companies for their actions and policies concerning control over information, privacy issues, and market dominance in areas related to public debate, large media conglomerates have been the traditional objects of analysis. More recently, Internet giants such as Google and Facebook have been critically examined and when the hype levels off, Twitter will probably be the next on the list. Malcolm Gladwell’s recent piece in The New Yorker may very well be an indicator of things to come. Whether the issues related to “social media” are important or not, I have the feeling that the debate overshadows questions and problem fields that may in fact be much more important. The most obvious case, in my view, is the debate on privacy on Facebook. While the matter is not irrelevant, I think that e.g. present and future state-run information systems such as the french EDVIGE, a central police database that assembles all kinds of personal information concerning select persons “of interest”, have been overshadowed by debate on whether your employer can see the pictures that document your drinking binges after somebody (you?) put them on the ‘Book. 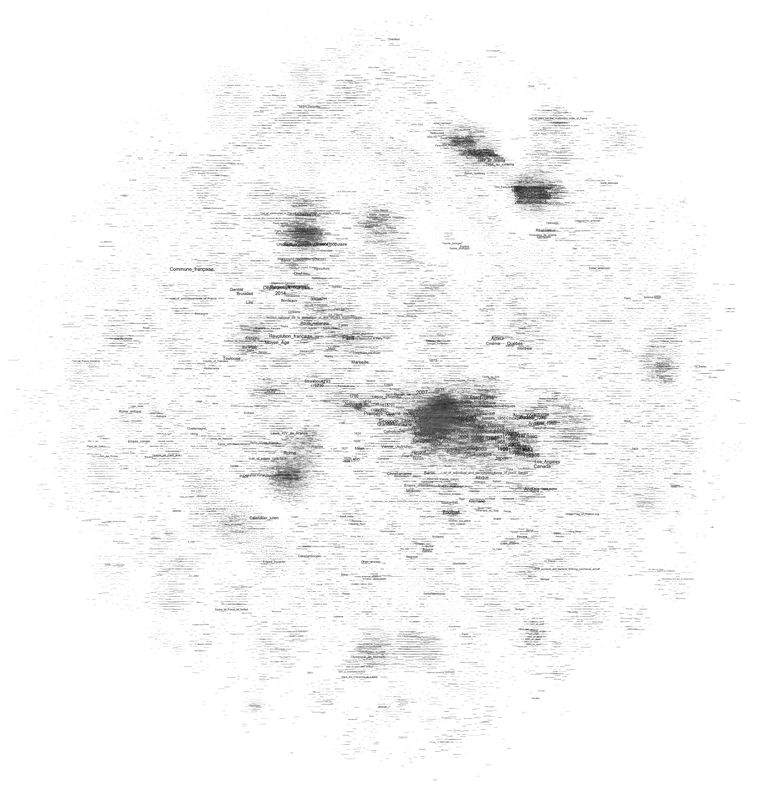 There is a certain disequilibrium in how Internet researchers and critics distribute their attention that has allowed all kinds of things to pass below the radar. But there is one event that has really shook me up recently, both because of its importance and the lack of outcry it garnered, at least in my echo chamber: the acquisition of the Reuters group by the Thomson corporation in 2008 and the creation of Thomson Reuters, an information giant second to none. I have stumbled upon Thomson Reuters a couple of times over the last years: first, when I researched the history of citation indexing, I learned that Thomson Scientific had bought the Institute of Scientific Information (and their Web of Science citation index megabase from which things like the notorious Impact Factor are calculated) in 1992; then again when I noticed that the ClearForest API for term extraction had be renamed, remodeled, and rebranded as OpenCalais after Reuters bought the company in 2007; finally, last year, when I noticed that the Reuters video platform appeared more and more often in articles and links. When I finally started to look a little closer (NYSE:TRI) I was astounded to find a company with a market cap of $31B, annual revenues of $13B, and 55K+ employees all over the world. Yes, this is no Apple big, but still very, very big for a company that sells information. I knew Reuters from my studies in communication science as the world’s biggest news agency (with roughly one and a half competitors: Associated Press and Agence France Presse) but I had never consciously registered the Thomson company – a Canadian Family business that went from the media (owning the London Times at one point) to publishing before transforming itself in a rather risky move into a digital information broker for all kinds of special fields (legal, health, finance, etc.). Reuters was a perfect match and I really wonder how that merger went through without too much hassle from the different regulatory bodies. Even more so when I found out that Reuters actually had devised a very spicy regulatory clause when it made its IPO in 1984: to avoid control over such a central source of information, no single shareholder would be allowed to hold more than 15% of the companies stocks. Apparently, that clause was enacted at least once when Murdoch’s News Corporation (already holding 15%) bought a competitor that also owned a piece of Reuters and consequently had to shed stock to stay below the threshold. The merger effectively brought the new Reuters Thomson under full control (53%) of The Woodbridge Company, a private holding that represents the Thomson family. Such control over a news agency (and the many more specialized services that are part of the giant’s portfolio) should give us pause in the best of times when media companies are swimming in resources, are able to pay good money for good journalism, and keep their own network of correspondents. But recent years have seen nothing but cost cutting in journalism, which has led to an even greater reliance on news agencies. I wager that Google News would work a lot less well if people actually started to write their own copy instead of remodeling Reuters’ and AP send outs. While the barriers of entry to the Internet are really low (you can have your own blog in minutes), scaling up to millions of visitors is a real challenge. Building your own datacenter is a real bump in the learning curve and to get over it, you need to make certain investments. But once you pass that bump, scaling suddenly becomes cheaper again because you have the knowledge ressources and experience that can now be applied to make the datacenter grow. One of Google’s strengths lies in this area and this immensely facilitates branching out into new information ventures. The same goes for Thomson Reuters: they master platform technology and distribution technologies for all kinds of contents and they can build on that mastery to add new things to serve information to a globalized planet. To use the language of the long tail: there may be more special interest information that can find an audience with shelve space becoming effectively unlimited; but there is also no longer a need for more than one shelve. The same goes for a more elusive matter: the mastery of information. The database techniques and indexing tools we use to store information – as well as the search and data-mining algorithms – can be very easily transported from one domain to the next. While it may be (very) difficult to create useful search tools for medical information, once you have built them it is rather easy to adapt these tools to, let’s say the legal domain. Again, this is what makes Google strong: basic search technology can be applied to advertising, books, mail, product prices, and even video if you can do automatic transcription. 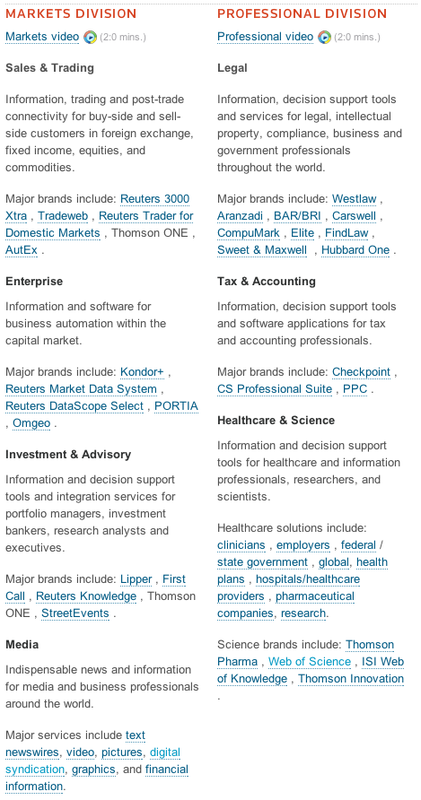 With the acquisition of ClearForest, Thomson Reuters has class-leading in-house data-mining and this is not something you can get by simply posting a couple of job ads in the local newspaper. Data-mining is extremely useful in areas where fast decision-making is crucial but also when it comes to building powerful search tools. Again, these techniques can be applied to any number of fields and once you have the basics right you can just add new domains with very little cost. These two points go a far way in explaining why the Internet has seen the lightning fast emergence of network giants over the last couple of years. I really don’t want to postulate yet another “law” of the Net but I believe that there is something to this idea of the bump: it’s easy to have a basic presence on the Web but it’s hard to scale up to a large audience and to use advanced computational techniques; but one you pass the bump, the economies of scale kick in and from there it seems like there are no barriers to growth. The Thomsons have certainly made that bet when they acquired Reuters and so far, it seems to work out quite nicely for them. I hope we can find a means to extend critique from questions of ownership into the heart of the (informational) beast and come up with better ways to understand how the still ongoing shift to exclusively digital information affords new means of handling and exploiting that information – with organizational, economic, and political consequences. While that work is starting to take shape for consumer companies like Google that are in the spotlight, there is surprisingly little on invisible network giants like Thomson Reuters that cater mostly to professional clients. If you are interested in the technique, it’s a simple similarity measure based on the vector-space model and my amateur computer scientist’s PHP implementation can be found here. The fact that the two posters who changed their “from:” text have both of their accounts close together (can you find them?) is a good indication that the algorithm is not completely botched. 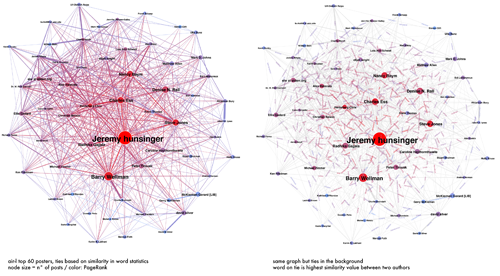 The words floating on the links on the right graph are the words that confer the highest value to the similarity calculation, which means that it is a word that is relatively often used by both of the linked authors while being generally rare in the whole corpus. Elis Godard and Dana Boyd for example have both written on air-l about Ron Vietti, a pastor who (rightfully?) thinks the Internet is the devil and because very few other people mentioned the holy warrior, the word “vietti” is the highest value “binder” between the two. First, a couple of nodes disconnect, two binary stars form around the “from:” changers and the large component becomes a lot looser. Second, Jeremy Hunsinger looses the highest PageRank to Chris Heidelberg. 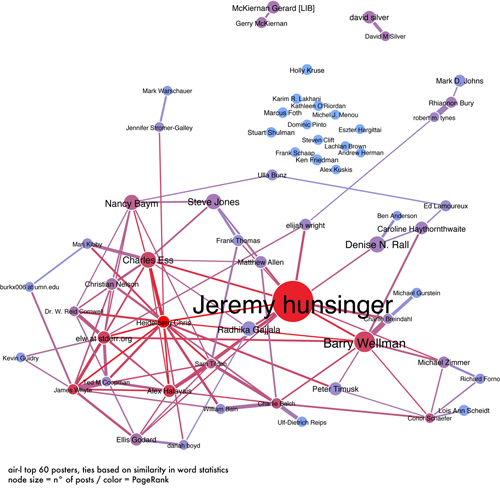 Hunsinger had more links when lower similarity scores were taken into account, but when things get rough in the network world, bonding is better than bridging. What is result and what is artifact? 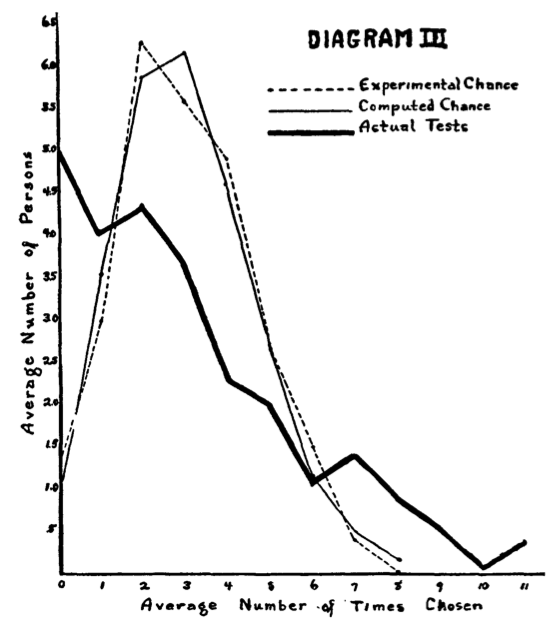 Most advanced algorithmic techniques are riddled with such parameters and getting a “good” result not only implies fiddling around a lot (how do I clean the text corpus, what algorithms to look for what kind of structures or dynamics, what parameters, what type of representation, here again, what parameters, and so on…) but also having implicit ideas about what kind of result would be “plausible”. The back and forth with the “algorithmic microscope” is always floating against a backdrop of “domain knowledge” and this is one of the reasons why the idea of a science based purely on data analysis is positively absurd. I believe that the key challenge is to stay clear of methodological monoculture and to articulate different approaches together whenever possible.